Synthstuff - music, photography and more...: Go Navy!!! Captain Richard Phillips rescued! Go Navy!!! 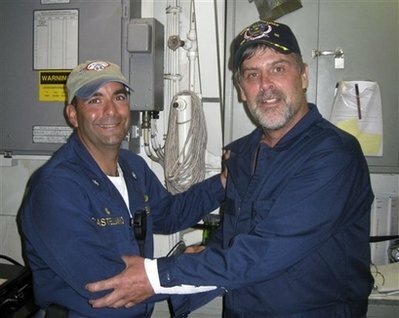 Captain Richard Phillips rescued! An American ship captain was freed unharmed Sunday in a swift firefight that killed three of the four Somali pirates who had been holding him for days in a lifeboat off the coast of Africa, the ship's owner said. A senior U.S. intelligence official said a pirate who had been involved in negotiations to free Capt. Richard Phillips but who was not on the lifeboat was in custody. The Justice Department said it was reviewing evidence and considering criminal charges against the captured pirate. Phillips, 53, of Underhill, Vermont, was safely transported to a Navy warship nearby.